I just got a 3mo old female Aussie and named her Zappa. Overall, she's absolutely wonderful. But I have some questions. First, Zappa was purchased by another family from a breeder who had an unplanned litter. They're working situation changed, which is why I acquired her. She had been taken twice to Banfield Animal Hospital inside a Petsmart. I'm very aware that Banfield is most likely not the best veterinarian to go to, and will be taking her to her first vet visit at a standalone vet who has excellent Angie's List reviews (all A's after several years). Zappa was prescribed Trefexis from Banfield for heartworm and other flea and tick control. My dog trainer said that she is aware of this drug and it is used often. My cousin who has three westies was telling me about how this drug has been problematic for some dogs, even causing death, and gave me a variety of links about the drug. Does anyone have experience with this drug? Are there better alternatives? I absolutely want heartworm, flea, tick, etc control as I know very well that Aussies need lots of outside time, and I have no problems with giving her that, but I also need to be sure she's safe. I'm not an anti-vaxer type and tend to steer clear of conspiracies, but overall, I just want what's best for Zappa. I've wanted a dog all my life and the last thing I want is for the wonderful dog that I've worked hard to have a great home and time and money to take care of her to be harmed by a drug. Even at 3mos, Zappa's nails are rather sharp, but not long. I recall hearing about the PediPaws, but I'm really not seeing lots of great reviews about this product, and many are saying that the Dremel is just as good. I was very used to cutting my own guinea pig's nails (owned guinea pigs for over 20 years), but working with a guinea pig is a little easier than an aussie, then again I don't have that type of experience. What is the best way to trim/reduce the sharpness of Zappa's nails? Banfield also told the original owners that Zappa had itchy skin and suggested an Oatmeal Shampoo and Conditioner (separate products). Because I do expect to bathe her once a week because of all her outside time, is this shampoo the right thing to use? The original owners gave me two bags of Purina. Without a second thought I knew that I needed better food, and I plan on switching her to a 5-star brand that's on Dog Food Advisor. Is it possible that this Purina food might be causing her itching from above? Lastly, I work from home and have the opportunity to spend lots of time with Zappa. However, there are times that Zappa just HAS to spend time with me, clawing me for attention. Sometimes I don't mind as I can afford to put work down for 15 minutes and play with her. But, there are also times where I do have to work. I do have a small playpen (not a crate) that I've put her in when absolutely need to work. I put several toys in there too. She can see me and hear me. Since I've started doing this, she's whimpers less and less, and usually starts napping within 10 minutes or so. Is this a healthy thing to do for her? Or am I not being fair to her? Sorry for all the questions, I just want what's best for my little girl. I appreciate any help. I can answer one of your questions for sure. DO NOT UNDER ANY CIRCUMSTANCES PUT TREFEXIS ON YOUR DOG. PLEASE LISTEN TO THE PEOPLE WHO WROTE THE REVIEWS ON THESE POISONS. Go to our website and read about all the problems associated with Frontline Plus and other flea and tick treatments. Our website is frontlineproductssilentkillers.com Trefexis has ivermectin in it and 50% of Aussies can not tolerate this drug. The MDR1 gene is missing in many herding dogs. We have two Aussies and one can't have this drug. Our other Ausse got seizures from Frontline Plus. It is very important to read the ingredients before you put it on your dog. All flea and tick treatments have chemicals in them. We use apple cider vinegar mixed with water and put in on them when going outside. It has worked so far. If you go online you can see natural products to use. Be careful there too cause just because they say they are natural doesn't mean that they are safe. Be careful. Good luck with your puppy. Read more about trifexis and ivermectin for dogs here. 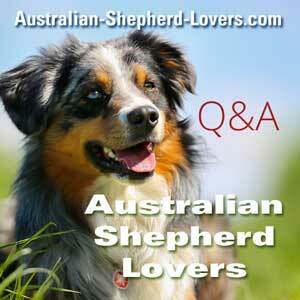 They, along with several other drugs, can be very dangerous for Australian Shepherds. Bathing: oatmeal shampoo is good for them but like everything else you can't use it all the time, they get use to it and it becomes inaffective. A citrus shampoo is good, like a tangerine and then about once a month use the oatmeal, also you can use a milk type shampoo in between washings of oatmeal and citrus. Nail Clipping: We use regular clippers and don't clip all the white out because you can clip too much and hurt her and make it bleed. Then after clipping we use a file and file down the edges so that they are not jagged. Trimming around their sanitary areas and their feet you should do because the hair grows fast there. Shaving their pad areas of hair you should do also. Trefexis: As with all drugs you should find out from your vet what they recommend ask questions as they are the professionals. My Vet told us (we have a Mini Blue Merle, a full size Red Merle and a Tricolor) that we should use Nexgard and Heartgard on ours. So far so good. Enjoy your little girl and spend as much time as you can with her. She will learn fast what you teach her. Aussies are the original Velcro. I must say that Zappa is very lucky to be in your caring hands! The WSU website above tells of their opinion of ivermectin in preventive dosages, etc. It also notes a problem with spinosad in combination with flea/tick meds. My dog is indoors and outdoors all day and we live in an area where tick and heartworm prevention is necessary. I've been using Sentinel for heartworm prevention. It contains milbemycin oxime, one of the problem drugs named by WSU; however, I have never seen any problems with it in my now-four-year-old mini (probably because of the dosage). I used to use K9 Advantix II for ticks and fleas. No problems except for some unfortunate itching. A few months ago, I switched to NexGard. It seems to be working fine and I have not seen any issues at all for my dog. My vet tells me that the larger dose is okay because there is a formula that converts the weight to surface/skin area and it ends up being almost the same, but ... hmmm. Although I have a high degree of confidence in this vet, I do cut a bit off of the tablet and soft chew - not too much, though, because I don't want to risk not giving enough and having my girl treated for heartworm. Note: I do not give both meds on the same day. I space them two weeks apart. In my case - Sentinel on the 1st of the month and NexGard on the 15th. Enjoy your life with your new buddy!